Well, last week’s blog post seems to have gone down well. It’s already one of this year’s most popular posts, and the feedback I’ve received so far leads me to believe that you like that sort of nonsense. Yes: today I present, for your enjoyment, even more ludicrous David Bowie covers. But instead of the obvious, we’re going to look at foreign-language covers of a couple of David’s early hits, namely Space Oddity and The Laughing Gnome. First up is Spanish duo Hermanos Calatrava with their dreadful version of Bowie’s breakthrough hit, which I believe would translate as Curiosidad Del Espacio, but they kept the original title anyway. Hermanos Calatrava consist of brother brothers Manuel García Lozano (Manolo) and Francisco García Lozano (Paco), and are a pair of ‘comedians, parodists and singers’, according to their Wikipedia page. With their take on Space Oddity they’ve attempted to turn the song into some sort of satirical sketch, but it backfires spectacularly. Issued as the B-side to their 1974 single Gigi L’Amoroso, It’s just horrendous. The pair have been hamming it up since 1955: it’s about time they stopped. 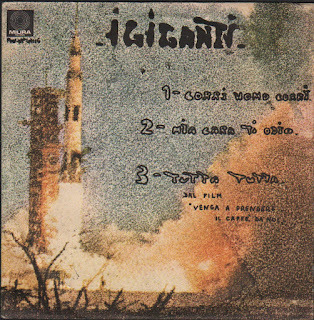 Next is Italian band I Giganti with Corri Uomo Corri, a reasonable ‘straight’ version of Space Oddity that was issued in 1970, just a year after the original. It’s nothing like as bad as the Hermanos Calatrava version, although the member of the quartet who handles the introductory vocal (who, I believe, is drummer Enrico Papes) sounds to me like he needs surgery: no one should sound that much like a bullfrog naturally. The psychedelic keyboard solo is a nice touch. Popular in their native land between from the mid-60s until the early 70s, they split around 1972 but a new version of the band, featuring some original members, resurfaced in 2008, releasing an album of re-recordings of their early hits. Incidentally, another Italian group, Computers, issued their own, vastly superior, version of the song, as Ragazzo Solo, Ragazza Sola, a year earlier. That translates as Lonely Boy, Lonely Girl, and is the same title Bowie used for his own Italian-language version, which he recorded in London shortly before Christmas 1969: I have found a press cutting where his then-manager, ken Pitt, states that he recorded the vocals at the beginning of January 1970, but I believe he actually did the deed on December 20. Wikipedia claims that our old friends Equipe 84 recorded a version that same year, but that does not appear to be listed at Discogs, so this may be a mistake. 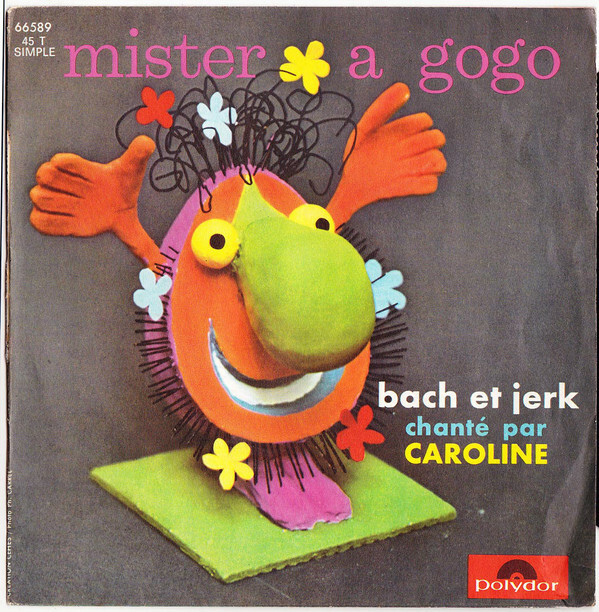 Finally, I’ll leave you with the utterly charming French yéyé singer Caroline, and her single Mister A Gogo, a fun but nutso version of The Laughing Gnome, issued in 1967 and now super-rare, commanding silly prices for the original single. I love this: I hope you will too! A balladeer from the 50s, Ronnie Hilton earned a place in the hearts of every Brit of a certain age for his 1965 hit A Windmill In Old Amsterdam. Hilton had a long career, first charting (with his debut release) in 1954 but issuing his last single in 1982. Born Adrian Hill in Hull, Ronnie started singing professionally under his adopted name in 1954. Signed to HMV, he amassed 18 Top 40 hits on the UK Singles Chart, hitting the coveted Number One spot in 1956 with his cover of the Rogers and Hammerstein song No Other Love, a US hit three years earlier for Perry Como. The following year he took part in the inaugural A Song For Europe contest, although he was beaten by another singer from Hull, Patricia Bredin. In 1959 he scored a hit with The Wonder of You, the same song that Elvis Presley topped the UK chart with in 1970. In 1967, two years after his last chart entry (with the aforementioned A Windmill In Old Amsterdam) he released the single that I wish to bring your attention to today, a cover of If I Were a Rich Man from the hit musical Fiddler of the Roof. It’s not a great version, and the utterly ridiculous inclusion of an impression of Quacker, the little yellow duckling from the Tom and Jerry cartoons in the middle takes it in to the realm of ridiculous. 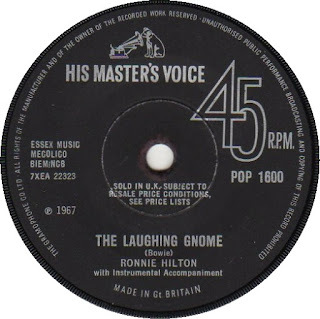 In fact, it’s good enough (or bad enough) to merit an inclusion here for that reason alone, but it’s the single’s flip side that’s the peach – a stupendously awful (and incredibly early) cover of David Bowie’s The Laughing Gnome. Yes: The Laughing Gnome. It, like Bowie’s original, did not chart, although Bowie would eventually have a hit with the song when his single was reissued in 1973. At this point in his career Bowie’s manager, Kenneth Pitt, was trying to market him as a songwriter; despite beginning his recording career in 1964 he would not have a hit under his own name until 1969, and it would take another three years after that until he enjoyed his second. Ronnie Hilton was not the first artists to cover Bowie though: in January 1967 Over the Wall We Go had been covered by stage star Paul Nicholas under the name Oscar. The following year Billy Fury would issue his cover of Bowie’s Silly Boy Blue. But the honour of having the first ever cover of a Bowie song goes to actor Kenny Miller (I Was A Teenage Werewolf, Touch of Evil, Attack of the Puppet People etc.) and his 1965 recording of Bowie’s Take My Tip (credited to Davie Jones), produced by Shel Talmy of Kinks/ Who fame. Hilton suffered a stroke in 1976. Following his recovery, he turned to radio presenting, fronting Sounds of the Fifties, a nostalgic radio series for BBC Radio 2. He died in Hailsham, East Sussex from another stroke, aged 75. 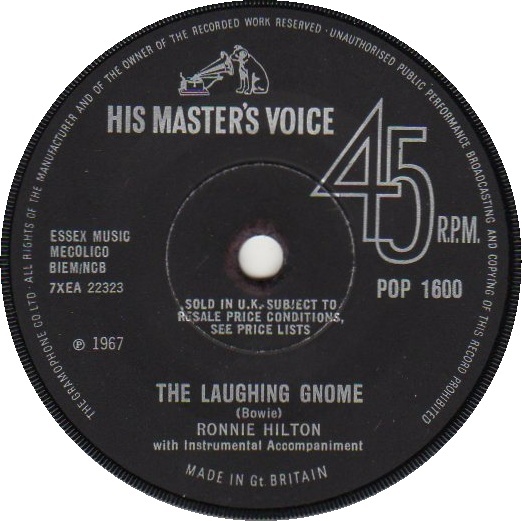 Here’s Ronnie’s preposterous version of The Laughing Gnome and, for good measure, If I Were a Rich Man. Enjoy! Recommended by our dear friend The Squire, this is one of the weirdest, wildest Elvis covers I’ve ever heard. It puts Eilert Pilarm, Elvis Pummel and the Legendary Stardust Cowboy to shame. 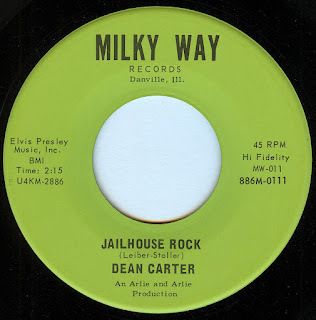 Dean Carter’s brilliantly insane version of Jailhouse Rock was issued in 1967. An insane mix of garage and psychobilly, Dean’s unhinged performance is a thing of wonder. The flip side, Rebel Woman, is pretty crazy stuff too. Dean Carter was born Arlie Neaville. He began playing rockabilly in the late '50s in Champaign, Illinois, and recorded for the Ping label in 1961 under his real name, before moving on to the more established Fraternity label in 1962 as Arlie Nevil (issuing the self-composed Alone On A Star/The Skip). After that he went to Limelight, where he first recorded under the name of Dean Carter. Neaville and guitarist Arlie Miller invested in their own recording studio, Milky Way, and the pair (as Arlie and Arlie) launched their own label of the same name to issue Carter’s Jailhouse Rock single, now a highly collectable and very expensive 45. Luckily both sides, and many of the other tracks he’s recorded over his varied career, were collected on the 2002 CD release Call of the Wild. In the early 70s he reappeared under his real name, Arlie Neaville, issuing a crazed cover of Breathless on Shout ‘n’ Shine Records. Since then he’s kept his original name, and has moved in to the gospel music field. You can find clips of his more recent work on YouTube, as well as plenty of examples of his wilder material. One of my more peculiar recent finds was this album, Songs for Swinging Children by the Groovy Gang. A dozen covers of popular hits, all with a kid-friendly bent. 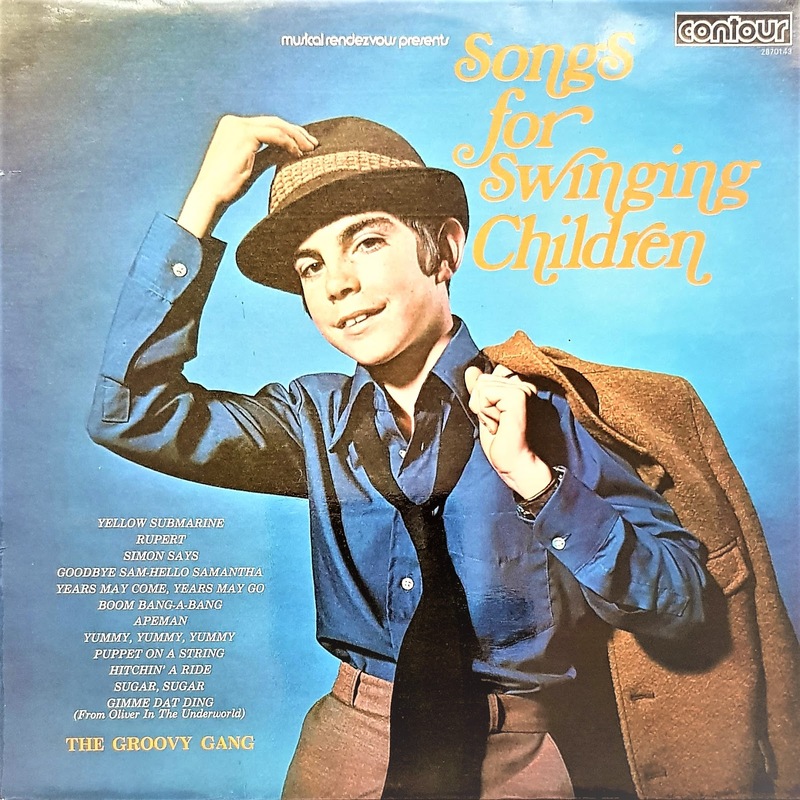 Don’t let the Sinatra-esque title or cover image fool you though, the only swinging these kids get up to is in the play park. No nelson Riddle arrangements or orchestrations, the twelve tracks included here are po-faced and perfunctory, knocked out in a spare hour in the studio (the notes on the back of the cover tell us that this recording session took place on June 10) by a bunch of tired moonlighting musos who would have probably been paid around £50 each for their trouble. It’s fairly safe to assume this was recorded in 1971: the album was issued that year and the most recent track, the Kinks song Apeman, was not issued until November 1970. What interests me is that the album was produced by Norman Newell, whose career was closely associated with Columbia records, and artists including Russ Conway, Shirley Bassey, and Cliff and the Shadows. Newell, a songwriter as well as a producer, also acted as an A&R man for other EMI labels, and was responsible for taking acts to Parlophone (Vince Eager) and recording soundtrack albums for HMV. Musical Rendezvous/Contour was a British company that specialised in cheap reissues of old Polydor stable recordings: the Beatles Hamburg sessions with Tony Sheridan were put out (in two different covers, both featuring the iconic Mersey Beat newspaper) around the same time, and in turn would become one of (if not the) first albums I ever purchased with my own money. A side note: the album includes a cover of the Pipkins hit Gimme Dat Ding. When researching this I was surprised to discover that the song had originally been recorded Freddie and the Dreamers. Gimme Dat Ding was composed for a musical, Oliver in the Overworld, that formed part of the kid’s TV show Little Big Time, hosted by Freddie Garrity. Freddie and the Dreamers released a soundtrack album of Oliver in the Overworld in 1970, but it was novelty act Pipkins who scored the international hit. Songwriter Roger Greenaway performed, as a member of the Dreamers, on the first recording, and Greenaway was one half of Pipkins. Small world, eh? Anyway, here’s a taster. The aforementioned Gimme Dat Ding and the Groovy Gang’s dull version of the Beatles’ Yellow Submarine.